Wouldn’t you let me drink wine with these proud lips? Violently lady, ah gimme your love! Doubtfully lady, I need your love! Obediently lady, ah gimme your love! Try to feel it lady, I need your love! Hold on...! What's the DATE today?! Yup, you're right... eventhough it might still be White Day in some countries, in my timeframe it's already a day late hahaha. Which means, that this post is NOT meant to celebrate White Day, but instead... BLACK DAY! In fact, it's never meant to go up on March 14th. Okay... that's not true, I had actually planned to do it yesterday, but then things happened here and there (Doh, the internet) so it got delayed, under my own healthy conscience. Then again, I guess it was meant to be for a nice guy like me, cause let's face it, I didn't get anything during Valentine, why should I give anything in return when I didn't have anyone to do so XD. Not that I'm actually celebrating, just stating here for fun, but let's see if I'm still in the same condition later on Singles Day (I predicted it will be though). Beside Black Day, today marks another festive day in the world as well, but this time, it's a more widely known due to its historical event. The Ides of March, is a festive to celebrate the God of War (no, not Kratos... T.T, but the myth God Ares / Mars) and it's usually celebrated by military parade. Yes, and if you've read the wiki link about the particular day, you'd realized that today is the anniversary of Caesar's death as well. You haven't heard about Caesar? What are you, somekind of hermit dwelling on a cave? Caesar is a one of the surgical procedure to deliver a baby!!!! Okay, I was trying to make a joke, but I think it kinda fell flat T_T, but hey, if you still haven't figure out who the hell he was, please click on the link and read it on Wiki. So, today's post is for the celebration of those 3 festives: White Day, Black Day, and Ides of March. How should I combine all these 3 different events? Simple! By singing a love song, sang from a single guy's perspective, coming from an old series about an ex-manslayer, who has retired from the bloody war. PERFECT! My cover song for today, came from another nostalgic series from the past. The battle and adventure of the reverse sword dweller, the Sakabatou. This is a story (fictional) of a remnant of the Bakumatsu war, who tried to live his peaceful days, to forget and re-lived his new life apart from his dark past as the legendary assassin Hitokiri Battousai. Of course -as in any manga/anime story would evolved- his dark past was way too dark to close that enemies from the past, or descendands of them, eventually are coming one by one to disrupt his day. 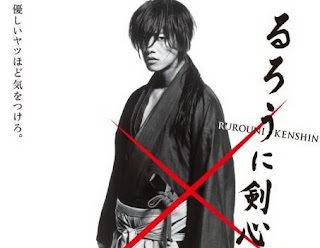 Yup, it's that awesome story of Himura, as in the one and only Rurouni Kenshin or globally recognized as Samurai X (due to the X mark on Kenshin's face). The manga spawned from 1994 to 1999, while the anime ran for almost 3 years (1996-1998). I was very much new to anime back then, and if I recall correctly, Rurouni Kenshin is one of the major factor that brought new life to anime in my country (upon its first appearance in the first Anime-Manga magazine ever released here). I was only a young boy back then, I haven't even finished high school during the time it was aired. The show was highly wanted though, and I could remember my cousins always booked the airing time and watch it religiously. Well, for me personally -as with the case of most shounen shows- (meh you've probably seen this coming anyway if you've read my previous posts of the theme) I've watched and enjoyed some of the early episodes, but then got lazy and never touch it again afterwards. This is the 1st anime that taught me about FILLER EPISODES though, cause I went confused when they started airing story that were NOT on the manga. Oh yeah, this is also the first anime that taught me that female seiyuu could voice a guy as well. Conclusion? For me the series is over-rated, seriously. The manga was good, I love the character design and all, (much better than the anime) but the overall hype was a bit way too much. It's like people (at least in this country) haven't had a decent anime in the past and praised it so highly, too highly, that some of my friends almost hated me upon hearing I didn't watch it anymore... Oucch. I must agree though, that it has became an important part of the past and the japanese animation industry in this country. So, eventhough not too much, I was excited when the news spread out last year (during the 15th anniversary) about the upcoming Live Action Movie. Unlike the live adaptation of a certain favorite game of mine that looked horrible due to the casting, this one looks very promising with all the fitting cast because it stays true to the original. Just visit the site I linked, and you can watch the trailer in its HD glory. Let's just hope the actual movie is much better than the trailer, cause well, you know the law: good trailer okay movie-okay trailer awesome movie. On to the song. This song became a big hit upon its release on 1996, and from the very first time I heard it, it has became one of my favorite Rurouni Kenshin songs of all time. It is performed by the now-disbanded J-Rock band, The Yellow Monkey, who led a spectaculars line of rising star musicians to be featured in the Rurouni world such as L'Arc-en-Ciel, Judy & Mary, T.M.Revolution and others. Most of them are now huge names in Japan's music industry, either in the same group, or a separated solo after disbanded. The song is sultry and seductive in its own way, about a seemingly depressed guy who is crazy in love with a woman, and he realized that the woman, the LADY is toying with his feelings but he just couldn't stop. He is deeply madly in love, that this song felt like summoning an inner emotion of a man, who is 'addicted' to the opposite gender. Call it crazy, and I also sees it that way, but then again 'love is blind', especially for men, so I approved. Love is just like a war right? It requires tactics and strategies... but when the player is already struck by craze, things could go in the worst way. A former best friend once came to me crying so heavily for a girl that he was cheating with, and when I told the girl not to play with his heart, he went crazy and end our friendship (I never heard from him eversince). Another ones, did similar fashion where they chose to pursue love and forgot about (and ditched out) friendship, and where they are now? Back to single (lover-less + friend-less) and unheard anymore. Yeah, call it crazy, but this song is PICTURE PERFECT! For me, singing this song is like giving a speech about those men who went crazy over love, speaking about LOTS of them in my surrounding while at the same time mocking them for their own stupid ways. The lyrics, even if I didn't like it for the message, is smart and can be DIRTY if you put it on a darker perspective, but yeah I like it! As in terms of how it's related to Caesar, beside the war theme of the anime, and the fact that Kenshin is a fearless frontman soldier, the song speaks highly about the seduction of a woman that makes even a tough guy falls on his knees (like Kenshin to Kaoru perhaps?). A perfect depiction of Caesar's feeling when he went head over heels to a certain Egyptian Queen, during the last era of his life (which led to his and her greatest falls *cough cough*). Simply saying, eventhough I'm not a J-Rock type, (usually avoid them as far as I can) this song in particular intrigues me, especially with the lyrics and that cool guitar intro. This song was actually meant to go up as a Valentine mockery message XD. The result was too good for it, and I liked it so much that I eventually saved it and post another classic instead. Not that Unbalance was a bad song, (that was my personal favorite as well) but simply because this song acts perfectly as the answer to Unbalance rather than in reverse. See it this way: How to handle an 'unbalance love' that happened during Valentine? By arranging 'Tactics' to eventually get the love, right? Especially when you're madly deeply crazy in love with that person. Hahaha yup, the songs compliments each other, so, I decided to halt it for White Day as a 'revenge' to the Valentine's post XD.